The state Department of Labor & Industrial Relations has announced the seasonally adjusted unemployment rate for September was 6.4 percent, a 0.2 percentage point increase from 6.2 percent in August. There were 591,850 employed and 40,250 unemployed in September, for a total seasonally adjusted labor force of 632,100. Nationally, the seasonally adjusted unemployment rate remained unchanged at 9.1 percent. The State’s job count received a boost from the opening of a new resort on Oahu as well as a rise in visitor related water transportation in September. The divergence between the increase in job count and the decline in labor force employment is likely due to an increase in multiple jobholders. 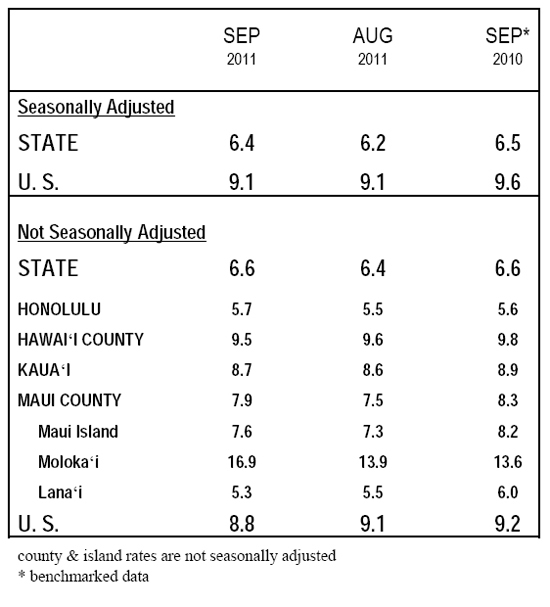 The unemployment rate figures for the State of Hawaii and the U.S. in this release are seasonally adjusted, in accordance with the U.S. Bureau of Labor Statistics (BLS) methodology. The not seasonally adjusted rate for the State increased to 6.6 percent in September from 6.4 percent in August. In a separate measure of employment, total seasonally adjusted nonagricultural jobs increased by 6,300 jobs or +1.1 percent to 595,900 jobs from August to September. Most of the job gains occurred in Government (+4,500), especially in the Department of Education, with the expansion primarily due to more hiring for the year-round school session, which until recently had historically not been as intense in the August-September period. Among major private industry groups, job gains were experienced in Trade, Transportation, & Utilities (+600), Professional & Business Services (+500), and Other Services (+200). Employment in Financial Activities was unchanged over-the-month. Job losses occurred in Education & Health Services (-300) and Construction (-500). In comparison with one year ago, total seasonally adjusted nonagricultural jobs have gone up by 9,700, or +1.7 percent, with the largest job expansion in Professional & Business Services (+3,700), Education & Health Services (+3,000), and Leisure & Hospitality (+2,300). Most of the growth in this industry occurred in Accommodations due to the grand opening of a resort on Oahu. Within this grouping of industries, the majority of employment expansion took place in Transportation; in particular, scenic and sightseeing water transportation (cruises). Job gains in professional employer organizations and temporary help services resulted in an overall industry increase over-the-month. Over the last 12 months, this industry grouping of miscellaneous services has been very stable, showing little deviation from the 26,500-level. Employment in this sector remained unchanged over-the-month. Declines in this industry grouping were concentrated in Ambulatory Health Care Services and to a lesser extent Social Assistance. Job contraction occurred in Building Construction and in sectors of Special Trade Construction integral to the structure building process, such as structural steel, framing, and site preparation contractors. Government rose principally due to a stronger than usual (in terms of the August-September period) staffing increase for the year-round school session at the Department of Education, especially for casual and hourly special instructional program workers and non-instructional support areas such as facility maintenance.